Henry Holt and Co., 9780805090406, 416pp. 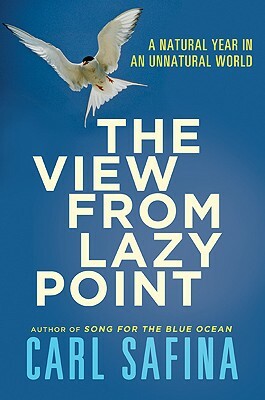 Beginning in his kayak in his home waters of eastern Long Island, Carl Safina's "The View from Lazy Point" takes us through the four seasons to the four points of the compass, from the high Arctic south to Antarctica, across the warm belly of the tropics from the Caribbean to the west Pacific, then home again. We meet Eskimos whose way of life is melting away, explore a secret global seed vault hidden above the Arctic Circle, investigate dilemmas facing foraging bears and breeding penguins, and sail to formerly devastated reefs that are resurrecting as fish graze the corals algae-free. Carl Safina, author of "The View from Lazy Point: A Natural Year in an Unnatural World," "Voyage of the Turtle: In Pursuit of the Earth's Last Dinosaur," "Eye of the Albatross: Visions of Hope and Survival," "Song for the Blue Ocean: Encounters Along the World's Coasts and Beneath the Seas," and founder of the Blue Ocean Institute, was named by the Audubon Society one of the leading conservationists of the twentieth century. He's been profiled by "The New York Times," and PBS's Bill Moyers. His books and articles have won him a Pew Fellowship, Guggenheim Award, Lannan Literary Award, John Burroughs Medal, and a MacArthur Prize. He lives in Amagansett, New York.